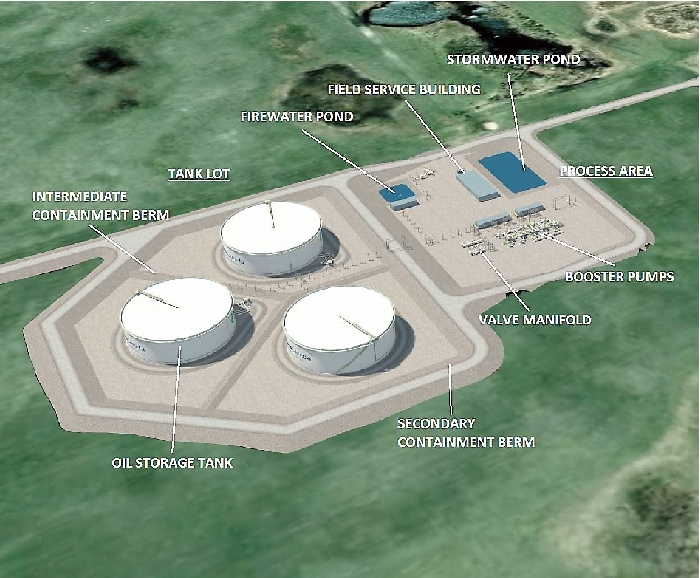 This tank farm, consisting of three 350,000 barrel tanks, would have been built at Moosomin as part of the Energy East proposal, which has been dropped now that the federal government decided TransCanada had to account for all upstream and downstream carbon emissions from oil that might flow through the pipeline. TransCanada Corp. is pulling the plug on its Energy East pipeline project, and the reaction has been swift and strong from Saskatchewan. The company had asked the National Energy Board to suspend its review of the project for one month after the federal government changed the rules, asking the company to account for all upstream and downstream carbon emissions from any hydrocarbons that might flow through the pipeline. Thursday it announced it is totally cancelling the project. Moosomin was an important part in the Energy East proposal. TransCanada has planned to build a massive tank farm at the Moosomin compressor station, a feeder pipeline from Cromer to Moosomin, and a separate pipeline, the upland pipeline, from Williston, North Dakota to Moosomin. “After careful review of changed circumstances, we will be informing the National Energy Board that we will no longer be proceeding with our Energy East and Eastern Mainline applications,” chief executive officer Russ Girling said Thursday. Souris-Moose Mountain MP Dr. Robert Kitchen said Thursday that the news is disappointing, although many expected the outcome when TransCanada asked for the review of the project to be suspended. Kitchen said the end of the Energy East Dream is a result of the government’s lack of support for the oil industry. “It clearly shows this government’s lack of support and for the oil and gas industry, its lack of showing confidence in the industry. As you know, and everyone should know, it is that confidence in the industry that allows people to invest in it and when that investment is not there then it’s going to hurt Canadians, it’s going to hurt my riding and the people that are in it. We went through an issue where all of the sudden the price of gas went up in the east when we had the issue with the hurricane because there was lack of oil supply here, but by their actions the government is showing more confidence in foreign countries like Venezuela and Saudi Arabia that do not abide by the same standards we have and we live by. We have the highest standards in the world, yet they will bring that oil to create gas and then they wonder why their gas prices go up. Kitchen sees the federal government as attacking rural Canada. Kitchen says he can see only one way in which Energy East could move forward—if a Conservative government is elected. Kitchen said the end of Energy East brought out strong emotions for him. Premier Brad Wall blasted the federal government for the rule change that led to the decision. “Today is not a good day for Canada. It is not a good day for the federation. It is a very bad day for the west,” he said. “TransCanada made the decision to cancel Energy East—but make no mistake, the reasons for it fall at the feet of Prime Minister Justin Trudeau and the federal government. They have been, at best, ambivalent about the project and then moved the goalposts at the last moment by asking the regulator to consider the impact of upstream greenhouse gas emissions. “Imagine if something like this was considered prior to the construction of auto assembly plants in Ontario or the factories that manufacture heavily subsidized jets in Quebec or the highways and rails that transport those products. “Former federal Liberal Cabinet Minister, and now Montreal Mayor, Denis Coderre, cheers the cancellation of this pipeline. He who leads a city that, just two years ago, used a pipeline to dump 4.9 billion litres, or nearly 2,000 Olympic-sized swimming pools, of raw sewage into the St. Lawrence Seaway. “It is a good thing that Mr. Coderre’s hypocrisy needs no pipeline for conveyance, for it would need to be very large and could never get approved for construction. “When Coderre cheers for the end of this pipeline, he cheers for the imported oil we buy from Saudi Arabia, where women can now drive, but the public beheadings continue. “He is cheering against an energy sector in our country that employs thousands and has paid, on average, over the last three years $17 billion annually in taxes and royalties to Canadian governments. “$17 billion is enough to pay for 680 new schools, 1.8 million knee replacements and 4.25 million child care spaces. We have lost an opportunity to strengthen quality of life in Canada. “Beyond the immediate impact, there are other reasons to be concerned. “A new Liberal carbon tax, new Liberal tax changes for small business (that will hurt many in the energy sector and farmers), changes to the NEB applied only to this sector and not to others, and methane regulations that will not be mirrored south of the border, with whom we must compete for job creating investment dollars. “We have a company that committed more than a billion dollars to a project and made earnest efforts to address the concerns of the public and regulators. A company that made 700 changes to its plans as part of that response. Make no mistake, other companies’ decisions to invest in Canada will be informed by this debacle. “The expectation of course from the federal government, and some powerful central Canadian interests, is that the west will just grin and bear this latest blow to our economy and our people. “That our taxpayers in Saskatchewan and Alberta will continue to send, without question, about $2.5 billion in equalization payments to help support Quebec that receives $11 billion in equalization per year and $1.4 billion to Ontario. All of this despite the fact that low energy prices have resulted in job losses and lower revenues for the last four years. “Something needs to change. For the west to continue on like this in our federal system is the equivalent of having Stockholm syndrome. “The decision by TransCanada to cancel the Energy East project was made because of a lack of interest and leadership, or worse, intentional decisions and policies of Prime Minister Justin Trudeau and his government. He should answer for this. He needs to be held accountable for this.